Above photo was taken during the 2018 Agribusiness Showcase & Conference Iowa CCA Awards Luncheon on February 13, 2018. Walter was honored with the Iowa CCA of the Year Award in February of 2018 and nominated by the Iowa CCA board to receive the International CCA of the Year Award in March 2019. Walter pictured front row left – the plaque was awarded to Armstrong for his dedication and commitment to what it means to be a CCA. Education and innovation are the hallmarks of the career of this year’s International Certified Crop Adviser (ICCA) of the Year Award recipient, Walter Armstrong of Ames, IA. For more than three decades, Armstrong has been listening to his customers and helping to solve their problems. Each year, one of the more than 13,000 CCAs is selected to receive this award based on his or her customer service, innovation, leadership skills, knowledge, and ability to exchange ideas and educate those in the agriculture community. Armstrong grew up on a diversified crop and livestock operation. He graduated from Iowa State University in 1984 with a bachelor’s degree in education emphasizing agriculture. Active in the Iowa CCA program, Armstrong has served as a board member, a marketing committee chair, and as president. While on the board, he sought opportunities to speak with college students about his vocation and the CCA program. Bill Northey, former Iowa Secretary of Agriculture, believes Armstrong’s leadership has fostered greater trust between farmers in the community and their CCAs. Armstrong has worked in the sales, marketing, and management areas of prominent agriculture companies and currently works for Bayer CropScience. It’s no surprise that an education major enjoys learning and advocates for education. Armstrong believes “the more you know the more you can help,” adamantly supporting the CCA program and the knowledge, skill, and professionalism it represents. The CCA program’s extensive continuing education requirements “encourages you to be more on your toes,” Armstrong comments. Learning and the exchange of ideas takes place not so much in a classroom but in the field assisting his customers. Perceiving a problem and figuring out possible solutions for the customers is what Armstrong enjoys most in his work. Combining experience and knowledge with innovative ideas that solve problems is Armstrong’s passion. Armstrong tries to understand the challenges his clients face on a day-to-day basis. He has been involved in helping design and market new equipment ideas and devising adaptations of equipment to meet the ever-changing challenges faced by producers. Armstrong, in collaboration with a chemical equipment manufacturer, was the marketing lead that developed spray kits for the conversion of floater spray equipment. This equipment was designed to navigate the rough terrain of CRP acres, spraying glyphosate in preparation for production. This concept minimized soil erosion caused by tillage and encouraged the use of no-till. Along with an equipment manufacturer, Armstrong was involved in the early developmental stages of equipment that would till and level the ground in one pass prior to planting. He also collaborated on a universal injection system that was able to apply an insecticide and fungicide in-furrow. Armstrong was also involved in the concept and design of equipment that saves farmers time by spraying glyphosate while no-till drilling soybeans. Armstrong views agriculture as an increasingly competitive and sophisticated business, “Not only are producers competing for acres but also markets,” he says. He sees CCAs deciphering the vast bombardment of digital information, using their education and skills to sort out what actually works and is practical from the continual stream of information. Armstrong expects the challenges of balancing production with environmental concerns to increase. “Producers need to produce as much as possible while simultaneously dealing with a shortage of individuals in the ag workforce. We will need to continue working toward environmental preservation and address soil and water quality issues.” The role of CCAs will expand with continued advancements in knowledge and digital technologies, Armstrong believes. New technologies will help provide answers, but this will be an evolving process. “CCAs will need to partner with other ag professionals as more pressure is applied to produce the world’s food in a safe, ethical way while preserving the planet,” Armstrong says. “The advances in digital technology and climate data enable us to overlay information on soil types, fertility, insect pressures, diseases, precipitate, humidity, heat, and other factors affecting production. This will lead to compelling changes for the future of agriculture,” he says. Armstrong believes CCAs are committed to agriculture and desire to see the industry continue to advance. Des Moines, Iowa – The Iowa Certified Crop Advisers (CCA) board of directors recognized one hundred nine individuals for their dedication to best management practices, professionalism, and years of service to agriculture as CCAs. The Iowa CCA program celebrated forty-one individuals for fifteen years (certified in 1994), forty-six individuals for twenty years (certified in 1999), and twenty-two individuals for twenty-five years (certified in 2004). Recognitions were held during the annual Iowa CCA Years of Service luncheon on Tuesday, February 12, 2019. The luncheon is annually held in conjunction with the Agribusiness Showcase & Conference (ASC) in Des Moines, Iowa. Certified Crop Advisers utilize best management practices that protect the environment and lead growers to produce higher yields and increased profitability for their farms. The CCA board also presented the “Iowa CCA of the Year” award to Adam Kramer, Allamakee County farmer owner-operator of Black Sand Granary. The Iowa Certified Crop Adviser of the Year Award is designed to recognize a CCA who delivers exceptional customer service, is highly innovative, has shown that they are a leader in their field, and has contributed substantially to the exchange of ideas and the transfer of agronomic knowledge within the agriculture industry. Iowa Secretary of Agriculture Mike Naig today announced two agribusinesses and two CCAs as recipients of the Secretary’s Iowa Ag Leader Award for Conservation. Naig two CCAs – Nancy Bohl Bormann from Algona and Tim Berkland from Spencer. At the Agribusiness Showcase & Conference, two-hundred plus of CCAs received continuing education training to maintain their certification. The 2019 ASC offered over a dozen hours of continuing education units (CEUs). An Iowa CCA must accumulate a total of forty hours of CEUs every two years to maintain their certification. The Agribusiness Showcase & Conference provides attendees the opportunity to explore the innovative tools they need to enhance their careers and grow their business. Save the date for next year’s event on February 11 & 12, 2020. The Iowa Certified Crop Advisers (CCA) announced the 2019 Iowa CCA of the Year earlier this month. 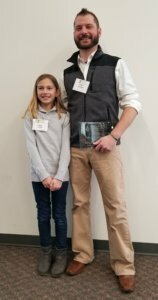 Adam Kramer, a small business owner in Prairie du Chien, Wisconsin and Waukon, Iowa farmer, has accepted this annual award during the Iowa CCA recognition luncheon at the Agribusiness Showcase & Conference (ASC) on February 12, 2019. The Iowa Certified Crop Adviser of the Year Award is designed to recognize a CCA who delivers exceptional customer service, is highly innovative, has shown that they are a leader in their field, and has contributed substantially to the exchange of ideas and the transfer of agronomic knowledge within the agriculture industry. Adam Kramer addresses CCA crowd at lunch on Feb 12. Kramer was recognized as the 2019 Iowa CCA of the Year. Kramer has been featured by the Allamakee Soil and Water Conservation District (SWCD) as a person striving to improve soil health and fertility on cropland he farms, including a feature by the Natural Resources Conservation Service (NRCS) in their “profiles in soil health.” Certified as a crop adviser in 2006, Kramer decided to build an implement to ground apply seeds for his winter mixes and began his cover crop journey at the beginning of October 2017 following his soybean harvest. “[Kramer] continues to find ways to innovate in this area to help producers get seeding done on time and in a cost-effective way,” say his colleagues. One of his current projects brings together government programs and private business. 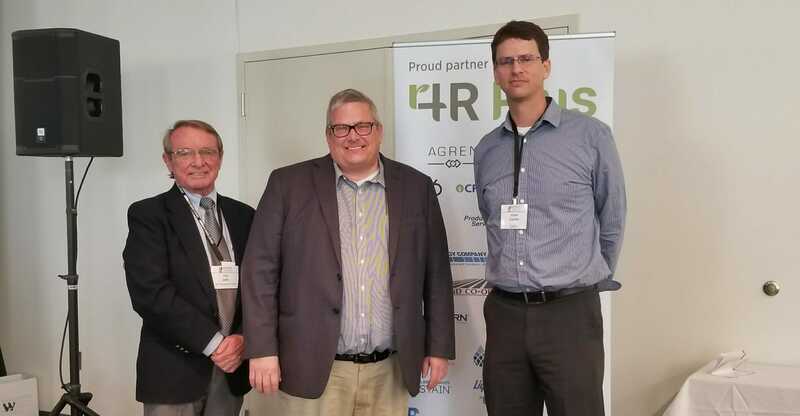 With this venture, Black Sand Granary, in Prairie du Chien, Wisconsin, is committed to aerial application of cover crops, and continues to work with district conservationists to develop seeding recommendations that work for the producer. According to the Allamakee SWCD “adding a small grain to a rotation can help to break up pest cycles, improve soil health, spread out workload, and reduce input costs when compared to corn or soybeans,” and applaud Kramer’s efforts on cover crops. This Allamakee county farmer, CCA, and small business owner is an example of how each producer can do their part in utilizing our natural resources in a sustainable and profitable way. “The community doesn’t exist to serve the business, our business exists to serve its community,” says Kramer. 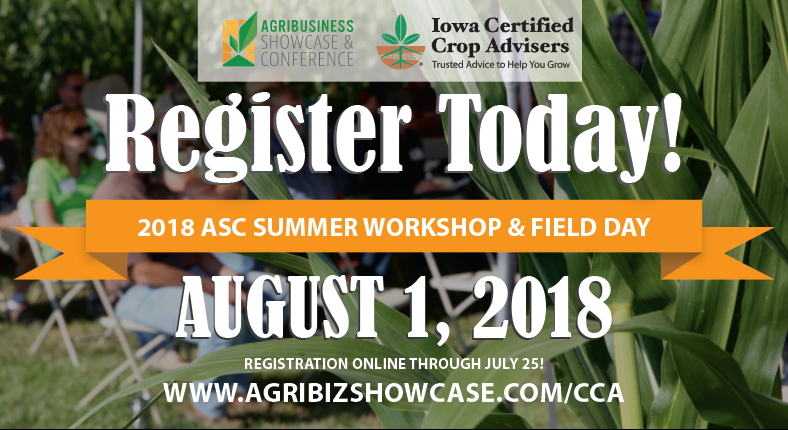 The Iowa Certified Crop Adviser program is supported at the national level by the American Society of Agronomy (ASA) Certified Crop Adviser Program. The CCA certification was established in 1992 to provide a benchmark for practicing agronomy professionals in the United States. CCAs meet examination, education, experience, and ethical standards that assure their competency as a partner to the producer in achieving the most from their farm.